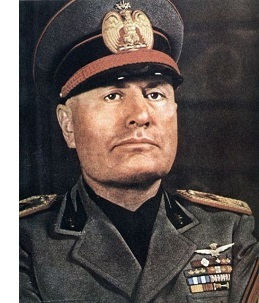 Benito Mussolini (1883-1945) - Before Hitler became Der Führer, Mussolini became Il Duce (which also means leader). Europe dabbled in fascism in the first half of the 20th century giving rise to several totalitarian states. Benito Mussolini was a key figure in the fascist movement, even before Hitler. In fact, in 1922, a year before Hitler's coup attempt in Munich, Mussolini became the legitimate prime minister of Italy. Despite this, he had little interest in the democratic process and immediately began transforming Italy into a dictatorship. It had been his dream for years. Well before he became prime minister, even before World War I, Mussolini had been active in the Italian Socialist Party. However, he had a falling out with the socialists by supporting Italy's entry into the war, which they opposed. After the war, he founded and became head of the National Fascist Party. The party grew quickly, and by 1922, 30,000 "blackshirts" (which is what its members were called) marched on Rome which led to Mussolini's appointment as prime minister. It wasn't difficult for him to acquire absolute power. At the time, Italy's constitution allowed for the prime minister to seize total control for one year by declaring a state of emergency, which Mussolini did (this provision may have dated back to the old Roman Republic in which the senate conferred power on a single individual during the Second Punic War). One of the first things he did was establish a police state with which to enforce his will. After that, it was simply a matter of making the dictatorship permanent. This was accomplished by eliminating any opposition; and after a year, there was no one left to stop him from staying in power. And speaking of Rome, Mussolini had visions of reviving the Roman Empire. He wanted to make Italy into a world power once again. Of the Axis powers, he was the first to take military action by invading Ethiopia (known then in Europe as Abyssinia) in 1935. Despite being victorious, Italy had the weakest military of the three (major) Axis Powers (incidentally, the term "Axis" was born from a reference to a preface written by Mussolini in the Germanica Repubblica in which he says "the axis of European history passes through Berlin"). In fact, Mussolini was opposed to Germany's invasion of Poland and wanted to postpone military action for at least another couple of years. Once hostilities did break out, Italy struggled on the battlefield and had to be bailed out by Hitler more than once. Due to Germany's military might, Mussolini found himself playing a subordinate role to Hitler. Between 1922 and the outbreak of World War II, there was a flip in stature of the two dictators. Since Mussolini rose first, Hitler was an admirer of his and wanted to emulate him in many ways. But by the early 1940s, Hitler had lost much of his respect for Mussolini and saw him as a drag on his ambitions. Italy was knocked out of the war before Germany and Mussolini was deposed in 1943. In 1945, he was executed.